Today we will hear from my mother. She is a memorialist. She likes to remember through rituals, memorials, and actions taken to create physical memories of Nora on this earth. So this month we will hear about her journey to memorialize Nora as it is the month of The Importance of Remembrance. Let's see how gardening helps my mother heal and in doing so she gets to act as Nora's Grandmother even in her death. 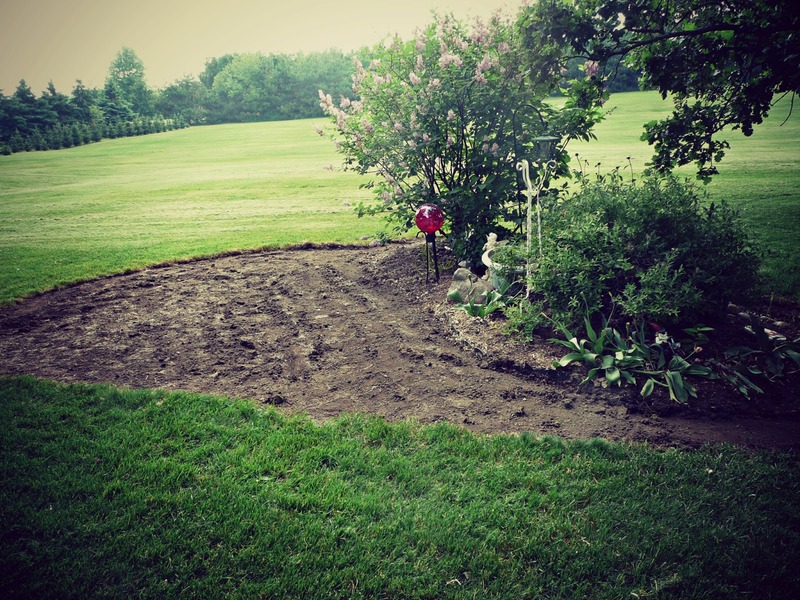 At Nora’s funeral, my scrapping sisters told me that they wanted to help me plant a garden for Nora—from turning over the dirt to transplanting plants from their gardens into mine. My BF Holly said it would be nice to include my ‘blood’ sisters (as she calls them) also, and spend a few hours talking about Nora as we grounded with the earth. It would be a real family ‘labor of love’. The idea was very appealing to me. Since that time Holly and I have had several outings to a local antiques mall. We talked about ideas for the garden, and once a ‘whimsical’ garden theme was decided on, we looked for things that could be put into the garden. Anything that looked to be child or storybook related we picked up and discussed. Talking with Holly on these excursions has been a very cathartic experience. She is a good listener and doesn’t judge my grief—probably because she is experiencing it also. I have come away from our excursions feeling a little lighter each time and with many great ideas for the garden. Once spring finally arrived I started the garden in earnest. I decided I would add to an existing bed, and that it should be right outside of the living room windows so that I could see it year round—a living memorial to Nora. I went out the first weekend in May and with my roundup, sprayed the grass in what I thought was an ameba-like shape. I was rather surprised when a day later as the grass started to die and turn brown, that the shape I had browned out on the lawn was a lopsided heart shape. Perhaps subconsciously I had done this to represent my love for Nora. As I lay in bed that same night unable to fall asleep immediately, my thoughts turned to the heart-shaped garden again. I wanted to put a meandering stone path into the garden and plant small yellow poppies in amongst the stones—my version of a yellow-brick road. Inspiration hit and I decided that the wandering path would go through the middle to imitate a broken heart—which is exactly how the family has been feeling with Nora’s stillbirth—heartbroken. I have found that gardening has always been my way to meditate. As I plant, pull weeds, and harvest food my thoughts turn inward and this is where I contemplate my life’s ups and down, think about problems, and come up with solutions. It seemed logical to me that a ‘Nora’s Garden’ would help me grieve. It was in May when I found the tree I wanted to put in Nora’s garden. I found a Weeping Pea Vine at a local nursery, which I just happened to have a gift certificate for. 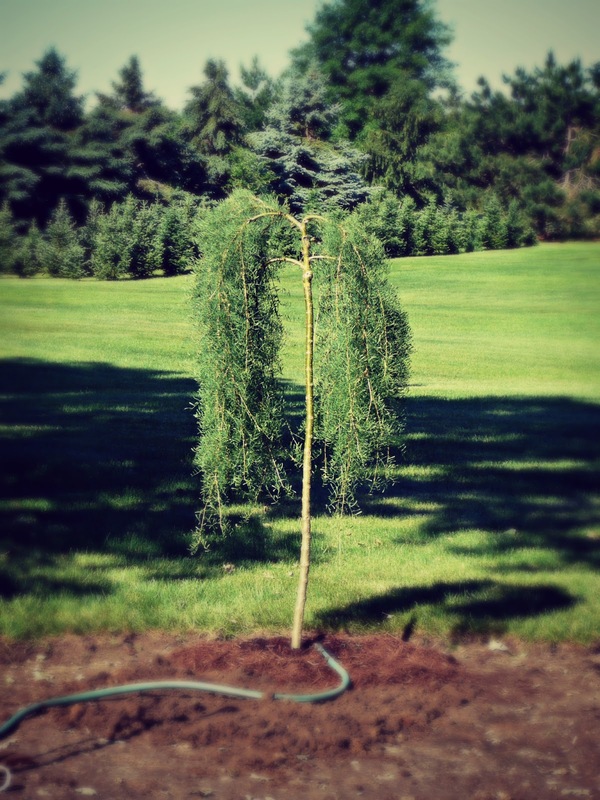 It would never grow to be more than 5-6 feet tall, and the downward arcing of the branches would forever represent the tears I shed for Nora. The leaves were very small and narrow. The sales person called it “ethereal”. I could picture Nora in my mind watch fireflies in the trees and thinking they were fairies. It was the prefect complement to Nora’s Garden. Knowing I would be busy until the end of the school year, I purchased it and asked it they could keep it until mid-June when I would have the space ready for planting. Done and done. In June, my husband cleared the browned grass just prior to him leaving for training for the summer months. It was his way of being a part of Nora’s Garden. A week later, I had the Weeping Pea Vine planted. Nora’s Garden was under way. I will be focusing upon the many aspects of Nora’s Garden in upcoming posts. It has been, and continues to be, a beautiful tribute to my beautiful granddaughter’s memory.